Warmups have commenced. 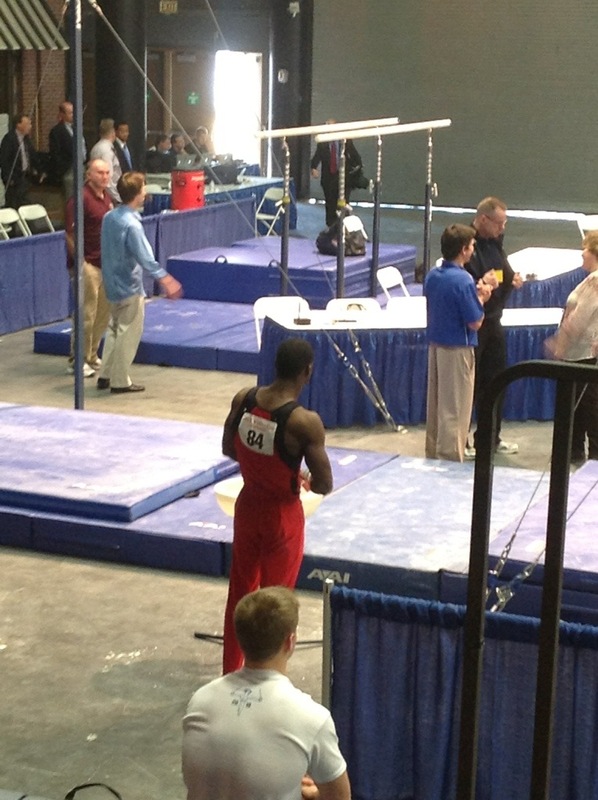 So far, only one big crash–Marvin Kimble on his Liukin on high bar, but he got up and brushed it off. So far, the men are looking extremely prepared. A few highlights so far: Akash Modi’s Kato (full-twisting double back) off parallel bars looks spectacular. Kevin Baker from Stanford is sticking all of his double-doubles on floor. Trevor Howard on VT: Big step forward on his 2 1/2. Matthew Felleman on VT: Stuck his handspring double front. Bum was a little low, but a HUGE stick. Great start to the meet. Paul Ruggeri on SR: Kip to V-sit cross. Jonasson to Yamawaki to flip to cross. Shoulders were a little high going into the cross. L-sit to bent-arm press to handstand. Front double pike off. Little hop on the dismount. Good start for Paul, especially since he seat dropped it on his dismount in warmups. Eddie Penev on PB: Peach to handstand. Diamadov. Tippelt. (Not very fluid to the handstand.) Healy. Stutz. L-sit press to handstand. Double pike. Step back on the landing. Kevin Wolting on FX: Opens with a Thomas. Front double to tucked front full. Back 1 2/2 to Rudi. Double full on the side. 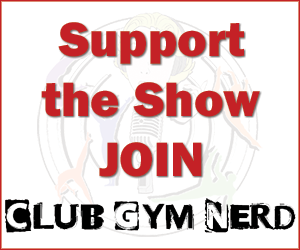 Split to straight-armed press to handstand. One of those staggish leaps into the corner. Back 2 1/2 to Barani. Chest low on landing. Stuck triple full–not quite all the way around, but a stick, nonetheless. Glen Ishino on FX: Front double full to Barani. Thomas. Whip to double full on side. Lovely Russian work on the floor: Press to wide-armed handstand. Stag jump to corner. Back 2 1/2 to a seat-height punch front. Step forward on his triple full. Jesse Silverstein on SR: Roll to Maltese. To cross. Roll to Cross. Yamawaki to Jonasson to straddled plange (legs a little low). Rings swinging going into his double front pike dismount. Little hop on the landing. Kyle Zemeir on FX: Running punch double front. Back 2 1/2 to a low punch front. Press to wide-armed handstand. Hitch kick. (I haven’t seen one of those in a while!) Double Arabian. A little low ont he landing. Front full to Barani. Russian work. Back double full. Full-in to finish. Tristan Burke on HB: Off on his Kovacs. Misses his giant after his Kovacs. Misses his Endo, and he’s off the bar. Full-twisting double layout for his dismount. Rough start for Tristan. It’s a shame because he was looking good in warmups. Marvin Kimble on PH: …and he’s off. I didn’t see what what he missed. Paul Hichwa on PB: Giant to tuck with a half. Front straddle 5/4 to upper arms. Healy to upper arms. Straddle cut. Double tuck to finish. Hop forward on the landing. As of right now, they aren’t posting scores. Will get print outs later on. Paul Ruggeri on VT: He missed this in warmups…. Round-off Half-on (Hands a little crooked on the horse) to front double full. Step back. Much, much better than warmups. Trevor Howard on PB: L-sit to handstand. Peach to handstand. Giant to handstand. Front uprise to 5/4 straddle to upper arms. Tippelt. Moy. Handstand to a pucky double. Big steps forward on the dismount. Christopher Stephenson on FX: Bails on a laid-out Thomas. Super scary, and I stopped watching. Glen Ishino on PH: He’s off the pommel horse. It looks like it happened on some simple loops (circles on the end of the pommels). Kevin Baker on HB: Hits his feet on a Yamawaki and somehow keeps going. Catches his Kovacs really close to the bar. Bent arms on giant afterwards. Step forward on his double-twisting double layout. Akash Modi on VT: Nice Kasamatsu full. Step back on the landing. Marvin Kimble on SR: Sing to straddle plange. Really nice position on that. I’m sitting right in line with the rings, and it was almost perfect. Yamawaki to Jonasson to flip to cross. (This seems to be a trend.) STUCK his full-twisting double layout. Sean Senters on HB: Nice, high laid-out Tkatchev and a really high straddle Tkatchev. Lots of stalder work in this routine. Stalder full and a Stalder 1 1/2. A little archy on his Quast (hop full). A pretty full-twisting double layout. Jonathan Deaton on HB: For the Tim Daggett fans, he’s a former Daggett pupil–now at Stanford. All eyes are on him because he is the last competitor in this rotation. No pressure, right? One-arm giant 1/1. Adler 1/1. Arms bent on his giant after his Kovacs. Nice straddle Tkatchev. Step back on double-twisting double layout. Touch warmup: Adrian Evans has the coolest high bar warmup. Giant, let go, thigh slap, catch, giant, let go, thigh slap. Eddie Penev on FX: Sticks his Penev. Back 1 1/2 to front 2/1. Back 2 1/2 to front full. Wide-armed press to handstand. Rudi to the corner. Stumbles out of his laid-out Thomas. Triple full to finish with a side shuffle. Marvin Kimble on VT: Pretty good height on handspring double front. But sits it down. Jesse Silverstein on PB: Pike press to handstand. Peach to handstand. Misses his hand on his peach to one bar handstand and comes off the bar. He’s okay, though–No Paul Hamm moment. Giant. Tippelt. A little pikey and off-kilter on his Diamadov. Cowboy on his front double front. Adrian Evans on HB: Yamawaki. Froggy Kovacs. An askewed Rybalko. Healy. Weiler didn’t make it to handstand. Full-twisting double layout to end. Sean Senters on FX: Piked double Arabian. Out of bounds. Whip half to front full. Russians. Arabian to corner. Back 2 1/2 to front tuck 1/2. Double full to finish with a hop back. Yul Moldauer on HB: He twists so fast on his Kolman. Really good hop on his Quast. Couldn’t see his dismount, but based on the crowd reaction, it sounds like he fell. Akash Modi on PB: Starts on the side–jams through to handstand. Tippelt. Healy. Funky legs on Diamadov. A little hop back on his Kato. That. Dismount. Is. My. Everything. If Bart were here, he’d agree. Austin Hodges on SR: He and Stanford’s Cameron Foreman are the last competitors on the floor. Uprise to straddle plange. Pretty good height. Inlocate to Jonasson to Yamawaki. L-sit to straight-arm press handstand. Rings swinging a bit. Sits down his front double tuck. Spoiler alert: Paul Ruggeri is about to debut his Kolman. Yul Moldauer on FX: Arabian to a punch tucked barani. Beautiful flair work!!!! Woah! A punch Randi! Press to wide-armed handstand. Double full side pass. Cartwheel into the corner. A little cross-legged on the triple full dismount. Overall, an impressive routine for a young’un. Glen Ishino on VT: Puts his hands down. Couldn’t see because of mid-rotation shuffle–looked like a Kasamatsu double. Trevor Howard on FX: A little form on his Tamayo. Double front. Back 2 1/2 to punch front full. Hands down a little late for his Laid-out thomas. Wide-arm press. Sticks his double Arabian dismount. Paul Ruggeri on HB: One-armed giant. Catches his Kolman super close to the bar. Barely gets his hand on the bar. Stretched Tkatchev half. Straddle Tkatchev half. Does what I called “Grinder” giants as a child. By that, I meant German giants. Gets his feet caught on the bar coming out of them. Double-twisting double layout for his dismount. Matthew Felleman on FX: Piked double arabian. Front layout to front double. Tucked Thomas. Russians on the floor. Press to wide-arm handstand. Double full to the corner. Side steps out of his back 1 1/2 to tuck front full. Step forward on his back 2 1/2 dismount. Matthew Loocthan on PB: Last routine of the rotation. Kip to L-sit to press handstand. Peach to handstand. Giant to tuck 1/2 to upper arms. Straddle cut to handstand. To half-pirouette to Moy. Double pike dismount with a hop. Chris Stephenson on VT: Yurchenko full with a step back. Paul Ruggeri on FX: Sticks his Tamayo (a bit of form.) Big step forward on his pike double Arabian. Thomas. Wide-armed handstand. V to press to handstand. Back 2 1/2 to punch front tuck full. Bell rings as he finishes side pass. Has to cartwheel and speed up to finish. Triple full. Step back. Over time. Fabian DeLuna on VT: Kasamatsu 1 1/2. Step on the landing. Craig Hernandez on PH: Starting this mid-routine. Beautiful flop work. A little form on his Russians on one pommel. A little off after his Wu but recovers. Sticks his dismount–as most do on pommel horse. Trevor Howard and Matt Felleman on PH: Just a general observation. Their belly button is at about a 45-degree angle when traveling. (It should be facing the end of the pommel horse.) Otherwise, good routines from both of them, and most importantly, they stayed on. Glen Ishino on PB: Upper-arms to straddle cut. Giant to handstand. Giant to tuck half. Half-pirouette to Moy. To another half pirouette. To Stutz. Double pike dismount, which was much better than during touch warmups–he nearly face-planted it. Apologies: Rotation 6 was lost due to wifi problems. What about rotation 6? How was sean senters vault?